Parking is available in the Market Street garage. The first hour is free to all, and we will gladly provide a parking pass for an additional hour. 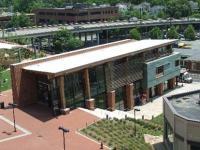 Market Street parking garage is located at 108 5th Street, NE. Ticketstoday tickets (for live music at local venues) are available at the Downtown Visitor Center daily from 9:15am to 4:45pm. Credit sales for Visa, Mastercard, American Express and Discover are accepted. Cash is not accepted at this location. All tickets have a service fee which is added to the ticket price at the time of purchase. Tickets are available for the following venues - the Sprint Pavilion, the Jefferson, and The Southern Café. Any special requests (e.g. Reserved, VIPs, ADA Compliant Seating, Comp Tickets, etc.) should be made through the venue&apos;s box office. There is no reserved seating available through this ticket office. Seating is chosen randomly based on best available.